I know, I’m a day late with this. I had work to do . . . both at work doing evaluation packets, and at home doing copy edits for Shannon Mayer. I can’t wait for y’all to read her newest book because it ROCKS! Werewolves, vampires, and harpies, oh my! Anyway, back to MY book. 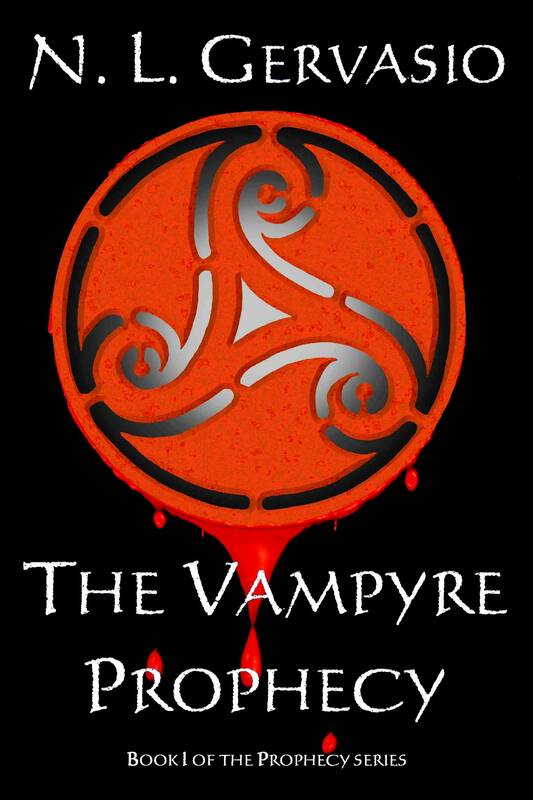 I’m offering you a sample of chapter one from The Vampyre Prophecy (revamped) today, edited by R.C. Murphy. This is a bit long, approximately 1600 words, but I hope you enjoy it . . . .
Siobhán O’Ruairc ran down the castle corridor with the monster’s footsteps trailing close behind. Each step increased in speed upon hitting the cold stone floor, echoing down the rock hall. When the noise dissipated, shadows crept across the walls, taunting her, changing in shape and size. The candle flames flickered from the passing gust. Outside, the wind howled. The monster’s growls blended with the tempest. Every time she had a chance to look back, lurking shadows were all she could see. She scurried down the dim hall, her long auburn hair streaming behind her along with her robes. Her frail hands clutched at stone walls for a better grip around the tight corners. A crash in the short distance behind her had her running faster, but no matter how fast she ran, she couldn’t get away from the monster chasing her. Just your imagination was what Cianán told her, but she knew otherwise. She cursed him and rounded yet another corner. She knew the monster from her nightmares was real. She fled deeper into the labyrinthine castle, unable to escape the horror behind her, and entered a familiar hall—the Ulster corridor. Her love named the wings after the five provinces of Éire. She came upon a door in the long hallway and slammed it shut behind her, locking the solid oak into place. She fumbled to pull out the key and it fell from her fingertips. Her breath caught in her throat when the key clanged against the stone and bounced, landing on the rug. Siobhán stood frozen, staring at the iron key. She snapped out of her trance, remembering why she ran into the room. If memory served, there was another door in the room that would take her to the lower part of the castle, which was filled with secret tunnels. She could sneak out to the stables and find help, or perhaps outrun the beast on horseback. A quiet sigh of relief passed her lips when she turned to find the door. She sprinted toward it. Thumbing the latch, she opened the door and stared inside at the wall. Siobhán ran her fingers all around the back wall of the closet, but could find no trigger. Tears trickled down her face when she realized she was in the wrong room. If she’d only gone down to the next room. She stopped breathing when the latch jiggled on the door behind her, hoping the monster would move on. She stared across the expanse of the bedroom, the full moon hanging low in the velvet sky casting enough light to see the details in the hand-woven rug on the floor. The latch stopped jiggling and footsteps retreated down the hall. Standing still for a moment longer to gather her thoughts and let the creature move farther away, she looked around the room to see if there was another way out without running into the monster again. She certainly couldn’t wait in the room; it would eventually figure out where she hid. Three floors up prevented her from using the window. A thunderous crash echoed from elsewhere in the castle. She sobbed quietly and knelt beside the bed, not knowing what she could do. The glimmer of hope she had left in her heart faded a little more. Siobhán opened her tear-filled eyes. Moonlight glinted off the key on the floor. The glimmer sparked, reigniting her hope for yet another attempt to survive the wretched night. Perhaps she had enough time to make it to the other room. A large splinter pierced her arm when the oak door exploded, sending wooden shards throughout the room. She stared at the shadow in the doorway, eyes wide, cupping her hand over the wound and crying silently. He stepped forward. The moonlight briefly revealed his identity. She closed her mouth, swallowed, and opened her mouth again, as if to say his name. The light touched his face once more, unveiling something new this time, something unrecognizable, save for one thing—the kind of smile that twisted, allowing every wrinkle to reveal the evil within. She slowly stood, trembling with fear and clutching the bedspread. He advanced on her. Stopping in the center of the room, he slowly shook his head back and forth. His long black hair moved against his shoulders. “Tsk, tsk, tsk.” He smiled and lunged forward. She lurched away from the bed, pulling the heavy bedspread with her. He crashed into the bedside table, shattering it, and fought to untangle himself from the quilt. She fled the room and ran down the corridor. Finally out of the labyrinth, she reached the top of the stairs and ran down three stories. The toe of her slipper caught a loop on the large rug at the base of the gigantic stairwell, and she fell forward. Instinctually, her arms shot out in front of her to absorb the shock of the fall; however, her face still hit the rug covering the hard stone floor. The locket she wore fell from around her neck, unlatching from the mishap. The foyer filled with the reverberated sounds of his growls. She crawled to her hands and knees, ignoring the pain of her cut lip, and looked behind her, up the enormous stairwell to see where he was. All she could see were those damned shadows jumping from one side of the stairwell to the other. Always the shadows, whispering from the darkness. She’d never seen anything else until just a few moments ago. Her lip bled and started to swell; the coppery taste hit her tongue when she inspected it in a swift lick. Siobhán untangled her foot and stood, pulling up the front of her long gown so she could run toward the massive oak door leading to her freedom. Seizing the large cold iron handle with one hand, she pulled on it, but the door refused to open. She wrapped her other hand around the iron and tugged franticly. With a silent scream, she tugged relentlessly against the hard wood, wanting more than anything to let the scream out, but the monster would hear. Giving up hope of ever escaping, she sobbed, the side of her face pressed against the door, her eyes staring at the latch. She blinked and focused her eyes on the latch, took the handle again, and forced the bolt back with her other hand. His breath hit her cheek, and she knew the chase was over. He pushed the hair away from the nape of her neck, and she shivered. “Go on, run some more, pretty, pretty, Siobhán. I’m rather enjoying this.” His voice was as cold as the winds of winter whispering against her flesh. He slammed his hand beside her head and ran it down the door, scratching the hard wood with his nails. It splintered into needle-like fragments. Startled, she turned her head until her eyes met his pale face. His wicked grin, the evil in his face, taunted her. Strange light danced beyond the iris of his white eyes, mesmerizing her with its lightning show. He moved his hand slowly toward her face, his nails lightly touching her cheek. His touch was as frigid as his voice. His glacial skin made her shudder, as though Death himself touched her skin. He ran his tongue over his lips and teeth, preparing them for a feast, and Siobhán couldn’t stop staring at his fangs. When he closed his eyes, she took the opportunity to run once more. He laughed in the midst of her dash across the foyer. She ran toward the nearest hall. He lunged for her in one giant leap across the grand entrance before she could reach her destination. When he grabbed her arm, his sharp nails seared her soft flesh. She spun around and screamed, slapped his face. He only laughed, the sting wearing off quickly with a shake of his head, and he grabbed her arm before she could swing again. “This has been interesting, but I’m done playing now, Siobhán.” He growled and forced her face close to his. His tongue flicked out to catch the blood remaining on her lip. He laughed at her struggles. “Why?” She fell to her knees, succumbing to his incredible strength. “Who, my lord?” She neither understood how he knew her name, nor whom he spoke of. But he withheld his answer from her and knelt beside her. She struggled to break free. Fear took over once again, but he pinned both of her arms behind her, putting an end to her last attempt to flee. She gasped when he cut into her neck with his sharp fingernail. His strong arms held her down to keep her still . . . and her lifeblood drained onto the floor. Siobhán felt her life fading away. She gasped again, trying to hold on to each waning breath. She wasn’t ready to die. But the thought of her love drifted through her mind. A faint smile spread across her once ruby lips. Perhaps she would be with him now. That was all she wished for over the last three years. But the face this monster appeared to have before attacking her in the room upstairs . . . a face she knew so well. One she trusted more than any other. The locket on the floor nearby flickered.